We've got a little friend that has been traveling this summer! Chirpy, our Summer Reading mascot, has been many places, far and near. For instance, Chirpy started the summer visiting with magician David Moon out at Upper Clements Park. 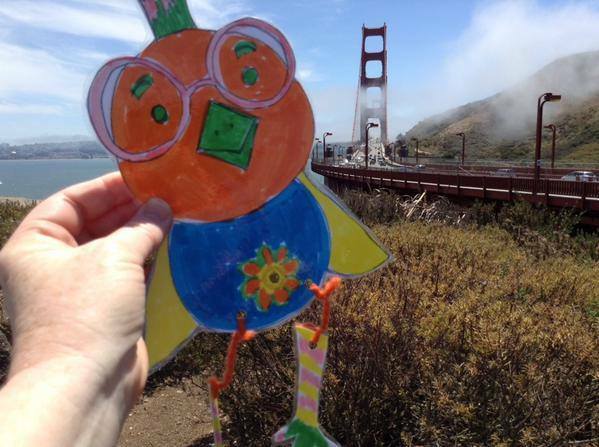 Chirpy then hopped into a suitcase and made it to San Francisco, and convinced one of our librarians to walk across the Golden Gate Bridge. going to the drive-in, visiting local museums, going out to restaurants, playing outside, and so much more! 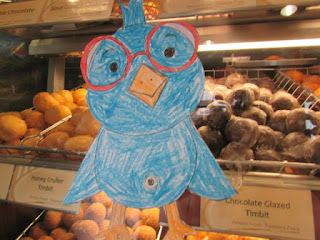 We've even heard that Chirpy likes donuts. 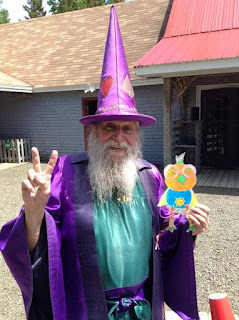 You can get in on the Chirpy fun, too. On THIS LINK you can find all the details on how to print your own Chirpy. Take a picture and email it to us, or tag it on Twitter, Facebook, or Instagram with #AVRLchirpy. Everyone who plays along gets entered to win one of our great prizes -- a ukelele, a set of Boomwhackers, or a Family Pass to Nova Scotia Museums! 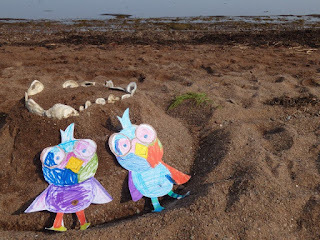 And if you want to see what Chirpy is up to, head over to Facebook and like us and see our Chirpy Gallery! Where will YOU take Chirpy? 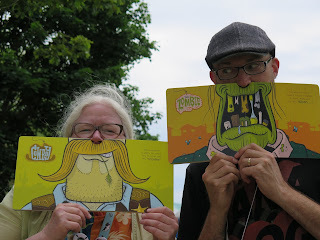 Summer fun: Read & Play! What's the most fun you've had this summer? We've been having a blast! 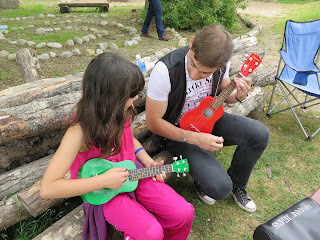 We've played outside, read outside, and learned a few new songs. Our Musical Zoos have been packed with crazy cacophonies. We've played with Ozobots and made all sorts of crafts. We've had a few puppet shows. 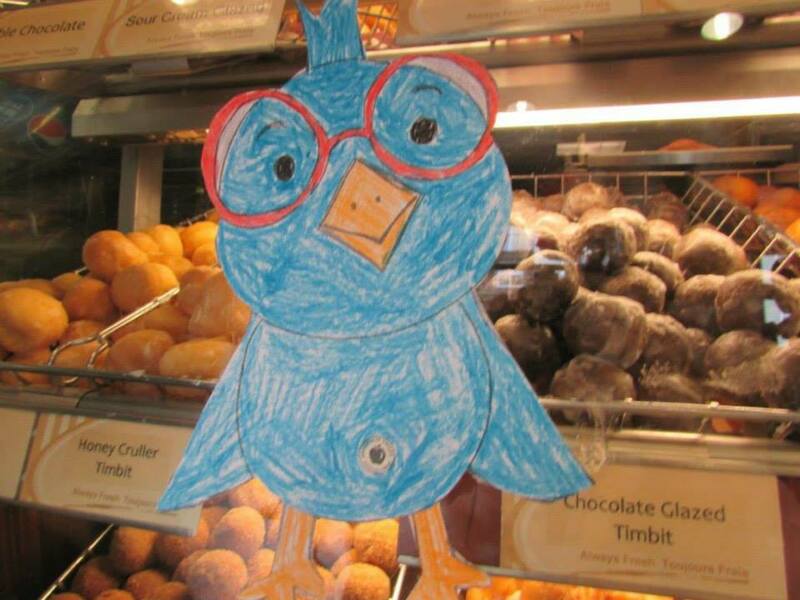 We've taken CHIRPY on the road and you've been showing us where you take our little bird, too. We've got Mad Science and Little Ray's Reptiles coming to a library near you. You can listen to music at several of our branches this summer. And there's still plenty more to come! Find all of the events on our CALENDAR. 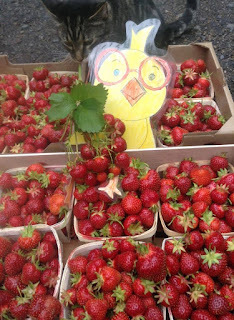 Look for us at Oaklawn Farm Zoo on Tuesday, July 21 (and August 11). We'll be out at Upper Clements Park on August 15 with our friend Scaredy Squirrel. Our fantatsic partners are making this a great summer for you! Find a good book, listen to a story, look at the summer sky, wear your sunscreen. Stop in and say hello - we'd love to be part of your wonderful summer! 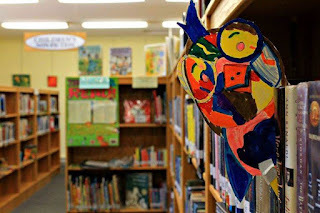 After 54 years in a large classroom at the Hantsport School, the Hantsport library has moved to the larger and brighter Isabel and Roy Jodrey Memorial Library at 10 Main Street, and according to Branch Manger Elizabeth Gibson, “We are loving it!”. Open to the public for just over a week, everyone who walks through the door exclaims over the spacious, bright atmosphere. The space “gives me a sense of peace” remarked one of the patrons. The south facing windows with a view of the playground and leafy green trees contribute to the peaceful feeling, making it a pleasant environment. There’s more space for everyone! Toddlers and older children have their own section to explore their favourite books and find new ones. The library is well stocked for summer readers! There is also a designated Teen Zone, which will be even more inviting once the new rug and furniture arrive. There are several comfy chairs for folks to sit and decompress with the daily newspaper, favourite magazine, or a book from the New Arrivals shelf. There are four public access computers ready for use, and plenty of outlets for charging your devices while you use the free WiFi. There’s room for friends and neighbors to gather and chat without disturbing other patrons or blocking the aisles. And the library is air-conditioned, so it is a great spot to cool off and relax this summer. The Citizens of Hantsport and Area saved their local branch library by raising over $200,000.00 to provide a new accessible location on Hantsport’s Main Street. The Hantsport Public Library moved from the Hantsport School and opened in its new location on June 27, 2015. “We are very pleased that the library is now open in its new location but much work still needs to be done before our official opening on September 23, 2015,” said Lorraine McQueen, Annapolis Valley Regional Library’s Interim Chief Executive Officer. “Community support made this project a success and in recognition of the generous support of some members of the Jodrey family the library will be known as, The Isabel and Roy Jodrey Memorial Library”. “It is a dream come true for our community which has lost so much recently. It is truly amazing what folks in small-town Nova Scotia can do when they work together,” said Susan Oickle-Shano, Chair of the Save Hantsport Public Library fundraising group. There’s still work to be done, though! There are plans for an outdoor book drop, and there is a lift that will soon be operational. The lower floor will eventually become a program room. If you’d like to help with these further improvements, visit this site to find out how. We hope to see you soon. Check out our selection of books, DVDs, audiobooks, or bring your laptop or e-Reader. Stop by for our programs, bring the kids in to sign up for the Summer Reading Club. Or just stop in and say hello. We’d love to meet you and show off our new space! 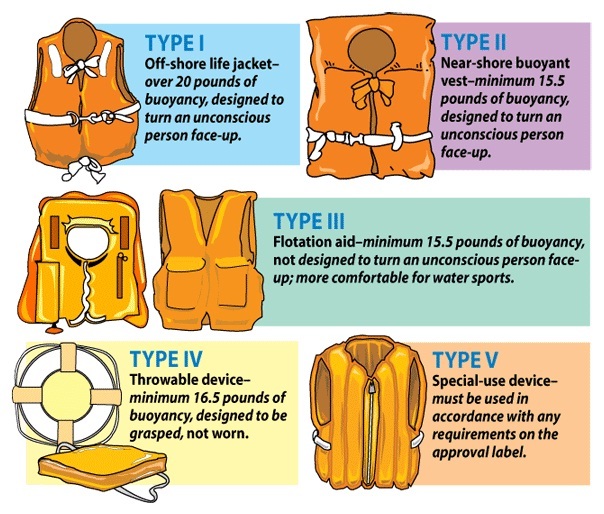 National Drowning Prevention Week is July 19th – 25th and this year the theme chosen by the Life Saving Society of Nova Scotia is YOUR LIFE JACKET – CHOOSE IT – WEAR IT RIGHT! . The goal of the Nova Scotia branch of this national volunteer society is to make Nova Scotia a Water Smart and Water Active province. 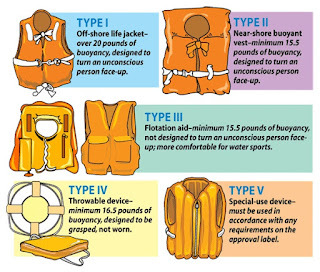 I am hoping this blog post will help spread the word on the importance on life jackets. Globally it is estimated that one million people drown every year and according to the Maritime Drowning Report 25 -29 year olds have an average yearly drowning rate of 3.8 per 100,000. That is only one section of our population however. A young child can drown in less than 2 inches (6 cm) of water so supervision along with prevention is crucial for this age group. 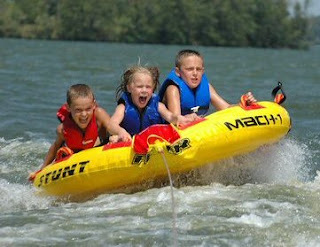 See Water Safety from KidsHealth for handy tips on water and summer safety in general along with first aid instruction. Boating is extremely popular for all ages and this is where a lifejacket can really mean the difference between life and death. With numerous lakes and the ocean all around us to explore the Safe Boating Guide is there to help you make sure that you are doing everything possible to ensure that this activity is safe for everyone involved. 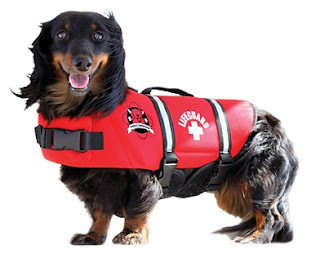 A lifejacket or personal flotation device is a small price to pay for peace of mind and the safety of yourself, your children and yes, even your pets. Take the time to choose the right jacket for the right activity, some guidelines are here. There are so many options now so you are sure to find a product that will suit. Once you have the proper equipment head out and enjoy the waterways of this beautiful province.